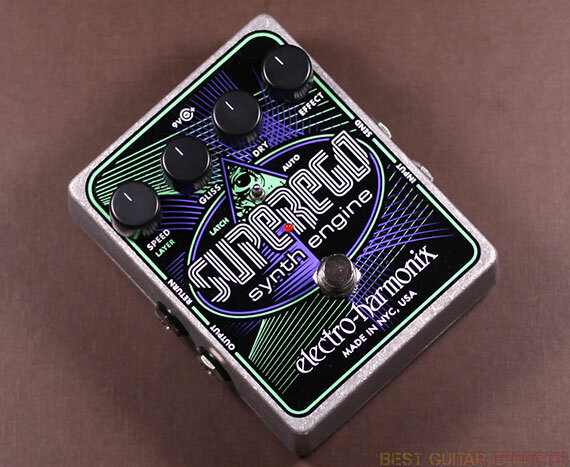 Electro Harmonix Superego Review – Best Guitar Synth Pedal? I like to generalize guitar players by dividing them into two categories. One kind of guitarist likes to keep things simple. They just want their favorite guitar, a good amp, and maybe an overdrive or wah on occasion. Other guitarists are a bit more extreme. They’ll seek out any and every new way to effect their sound and are always looking for new guitar pedals to mangle and shape their tone. If you’re the second type, then Electro Harmonix has a new synth pedal you may be very interested in. 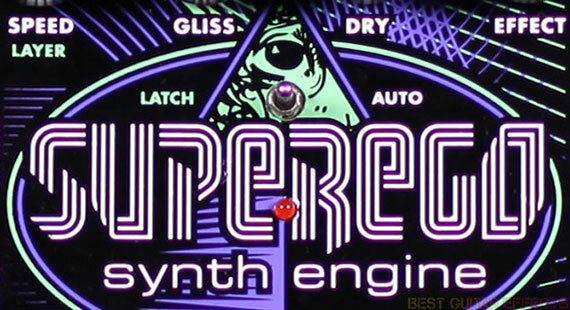 The Electro Harmonix Superego Synth Engine uses polyphonic granular synthesis to sample and loop what you play through it. An optional effects loop for the effected signal adds infinite possibilities. It reminds me of the Electro Harmonix Freeze pedal juxtaposed with a sound-on-sound looper or delay pedal with an effects loop… on steroids. Even that description doesn’t really do the Superego justice as this pedal is one of the most original creations I’ve ever encountered. It is the best guitar synthesizer pedal out there? Let’s find out. I’ll run down the features of this revolutionary pedal and dive into the Electro Harmonix Superego review. 3-Way toggle switch for selecting between Latch, Momentary, and Auto modes. Auto mode captures, freezes, and sustains notes and chords as you play. Momentary mode allows sampling and holding of single notes or chords when pressed. Latch mode allows layering of sampled notes and chords. Gliss knob controls portamento function when switching notes and chords. Volume controls for Wet and Dry levels. Speed/Layer control for adjusting attack and decay of the frozen sound in Momentary mode. It adjusts decay time of auto triggered samples in Auto mode. It adjusts the volume of previous layers in Latch mode. Effects Send/Return for inserting effects into the wet signal. Starting off with the Momentary mode, I plugged in my Strat and went for a warm clean amp setting to get a feel for this pedal. Pushing down the Superego’s footswitch allows you to sample a segment of your playing and continue playing over it for as long as the footswitch remains pressed. This happens pretty quickly as the Superego grabs and loops a smooth texture of the initial notes or chords ringing out when you press the footswitch. The Superego is a beautiful pedal for adding interesting textures to your playing, allowing you to create ethereal accompaniments quite unlike any other synth pedal I’ve ever heard. The sounds of pedal are divinely inspired. The Speed knob allows you to control how long it takes the effect to fade in when activated and fade out when released. It’s pretty easy to get a feel for the pedal’s subtleties and dial in some truly mesmerizing effects. The Superego really excels at adding emphasize to held notes during a solo or for creating droning foundations to play over. I find that the Superego can be quite sensitive to your pick attack. It’s best to “feel” your way into this pedal to get accustomed to how it samples your playing and triggers its droning effects. You’ll find that the smoother your technique is, the better this pedal sounds as is the case with just about any great pedal really. In Auto mode the Superego automatically detects note changes and samples the new notes you play. I was able to find the threshold for sample detection and with careful use of picking dynamics, hit notes harder to trigger sample notes while playing more softly to add melodies over the top. By turning down the volume of the Dry signal, you can really hear the glissando of notes and chords as the Auto mode morphs from one to the next. The glissando of the Superego is a very textural effect that is unlike anything else out there, offering unique sounds as notes and chords morph into each other. Well, actually you can find similar excellent sounds in the EHX HOG2 from which these glissando effects are based. A slight latency may sometimes be noticeable when listening to only the effected signal as the Superego samples its loop after the initial attack. This very slight delay is necessary to sample such pristine loops and is perfectly acceptable for dreamy soundscapes where feel is more important than strict timing. When blending the wet and dry signals, the latency is further rendered a non-issue as the Superego fades in its characteristic sounds after the initial attack. The Latch mode lets you stack layers of sound. The Speed knob controls how many layers you can hear stacked. You could use this mode to carefully add harmonies and layer note fragments or build a wall of sound to infinity. The controls are actually fairly easy and intuitive to use yet provide just enough flexibly to sculpt its unique Superego synth effects. The Superego really shines when you use other pedals in the effects loop, offering a whole new layer of depth to the sounds it can create. I experimented with various tremolo, delay, and reverb effects and also the Electro Harmonix POG 2 and Big Muff Pi with Tone Wicker with very musical results. Integrating the Superego with other pedals offers unlimited creative potential for adventurous musicians. Also, I highly recommend running the Wet signal with effects into a separate amp for even more interesting possibilities. This pedal offers endless variety and will help create truly amazing soundscapes in the hands of the most creative and experimental guitarists. 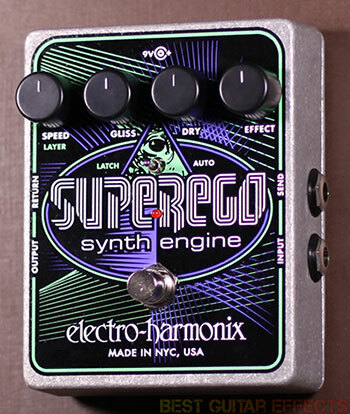 The Superego is a shining example of the kind of effect (along with the Ravish Sitar and B9 Organ Machine) that could only come from the brilliant engineers over at Electro Harmonix. Let’s have the final result. The Electro Harmonix Superego is destined to become a coveted classic among guitarists who can appreciate what this unique sonic implement is capable of. Whether you’re adding subtle accompaniments or creating atmospheric soundscapes, the Superego gives you tonal possibilities that you won’t find anywhere else. It’s intuitive and easy to use, yet is as expansive and infinite as your imagination. The Superego is truly an instrument in its own right. Those who seek out the myriad possibilities contained therein will reap great rewards as this pedal offers a promise of great musical attainment to those who achieve unity with the Superego. That concludes my Electro Harmonix Superego review. Thanks for reading. 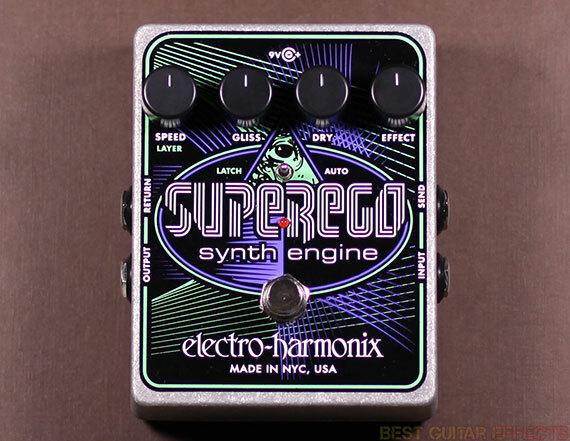 Want to buy the Electro Harmonix Superego Synth Engine?